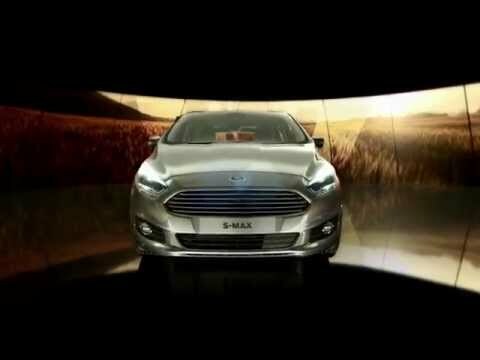 The all-new Ford S-MAX reimagines Ford’s unique sports activity vehicle with cutting-edge design, technology and driving dynamics. Seating up to seven adults in a calming “dynamic sanctuary” interior and offering enhanced versatility, the all-new S-MAX retains an instantly recognisable silhouette while incorporating Ford’s latest global design language. Advanced technology includes Multi-Contour Seats with Active Motion massage function, the first use of Ford Glare-Free Highbeam lighting, and Pre-Collision Assist for avoiding accidents at motorway speeds. The latest Ford EcoBoost and TDCi engines deliver optimised fuel efficiency, alongside a chassis tuned for a class-leading driving experience with Ford Adaptive Steering and Intelligent All-Wheel Drive. The all-new S-MAX offers style, driving pleasure and advanced features without sacrificing space, flexibility and fuel efficiency. The Ford design team evolved the fresh and distinctive exterior styling of the original S‑MAX for an even more dynamic and upscale impression. The sleeker styling makes economical use of graphic design features to avoid “visual noise”. The front pillar is moved further back to create a longer, sculpted bonnet for a more premium appearance. A raised chrome trapezoidal grille and slim headlamp design give a technical and cutting-edge look. The charismatic S-MAX silhouette and distinctive window-line is now even more desirable, complemented by signature LED Day Time Running Lights and technically styled rear LED taillights that add visual width. They are connected by a signature satin chrome strip. A rear diffuser separates integrated exhaust pipes for a modern, sporty feel. Inside, a mature, sophisticated and dynamic feel includes a sculpted centre console that flows from the upper instrument panel; aluminium accent above the glovebox; and stadium style seating design for second and third row seating space. The open and airy interior benefits from a full-length panoramic glass roof and smart design seats with thinner seat backs to provide more legroom. Soft-touch materials and accent stitching are used throughout the all-new S-MAX interior. Materials can resist the wear and tear delivered by active families through anti-stain coatings and durability testing includingsoil and coffee application. A Lane Keeping System (standard on Titanium and Titanium Sport) uses a forward-looking camera to detect if you’re accidentally drifting out of lane. Lane Keeping Alert then warns you by vibrating the steering wheel and displaying a visual warning. If you're slow to react or don’t respond, Lane Keeping Aid can provide steering assistance to help guide you safely back into the right lane. The technology is designed for multi-lane roads (like motorways), so will automatically deactivate at speeds below 43mph (65 km/h) or can be turned off manually. With a comprehensive package of safety measures built-in, your All-New S-MAX is designed to offer you and your passengers the highest levels of protection. Pre-Collision Assist with Pedestrian Detection detects people (and large objects) in the road ahead, or who could cross the vehicle’s path, and warns you of their presence. If you don’t respond, the system automatically applies the brakes. This new technology is designed to help reduce the severity of accidents, or help avoid them altogether, and functions at speeds of up to 50 mph (80 km/h). Emergency Brake Assist (EBA) helps your vehicle achieve maximum braking effectiveness in an emergency situation. It’s controlled automatically via the ESP system, which senses how much pressure you’ve applied to the brake yourself and automatically increases it, if necessary. An optional Blind Spot Information System (BLIS) can help you change lanes more safely, thanks to RADAR sensors that scan the blind spots on either side of your vehicle. If they detect a vehicle you can’t see, an orange light, displayed in the corresponding side door mirror, illuminates to warn you. BLIS also features a completely new technology, Cross Traffic Alert. A Thatcham Category 1 alarm is a sophisticated system that automatically arms itself when you double-lock the vehicle and will sound a powerful alarm if triggered by forced entry, the car being lifted, or if the motion sensors pick up any movement inside.